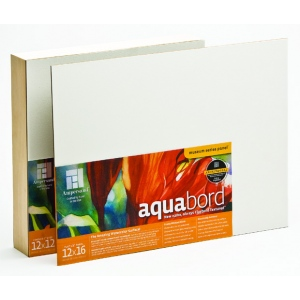 * Aquabord is a clay coated hardboard panel that gives watercolorists unprecedented freedom and control. * Comparable to watercolor paper, this multimedia panel simulates the absorbency and texture of cold pressed but allows color to be lifted back to white easily while also leaving the richest, most vibrant color possible. * This reworkable surface provides natural looking highlights, fluid glazes, transparent subtle layers, and the ability to lift color while the surface is wet or even after it is dry. * The truly amazing part is that finished watercolors can be sealed with a spray fixative like Krylon UV Resistant Clear Coating #1309 (Matte) or #1305 (Gloss). * Now available with the 2" Deep Cradle!